Come together. 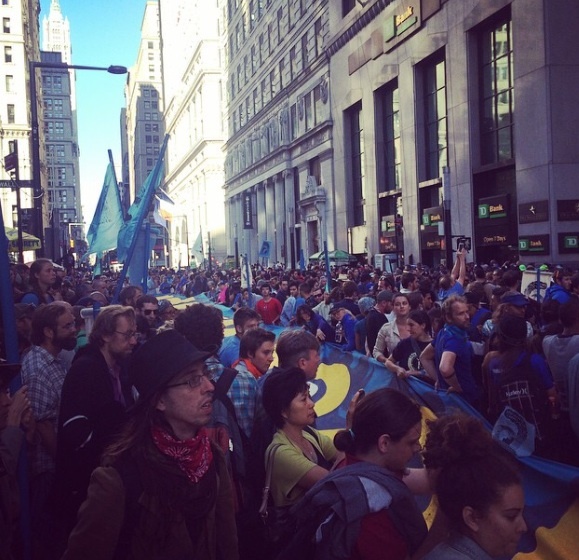 The People's Climate March. Yesterday was a day we, and all of our environmentally friendly friends, have been waiting for. Yesterday the UN conducted a conference where they addressed the state of emergency our earth is in. 400,000 people marched the streets of New York in what can only be described as a mass demonstration for the betterment of the world. Mermaids and mermen everywhere came together for what the press is calling the People’s Climate March. At times the crowd stretched for four miles and over 1,500 groups convened in Central Park beforehand. This march “was the biggest single mobilization of climate activism in history” and was raising awareness because in 2013, global carbon emissions reached record levels. Not to rain on the parade, but multiple sources have brought forth a substantial amount of backlash regarding the trash left behind after the march. Photos have surfaced of plastic cups, straws and bags piled on sidewalks in the street. It was a positive reminder that if we are truly going to 'walk the walk' (especially across New York) we want to be as genuine as possible. While some have criticized the marchers for “distinctly contradict[ing] the purpose of the march in the first place”, the city of New York backed the marchers and lent a hand to have the entire city cleaned up by the next morning. So while countries, cities and heads of state everywhere are being called to fight for the environment, we are all on this battlefield together.